Sales volume. Overall, down 4.69%. Condo sales volume was up 5.1% YoY, but home sales volume dropped 13.98%. All categories of single family homes saw a decline in sales volume: -20.69% for 2 bedroom homes; -18.44% for 3 bedroom homes; and -5.19% for 4+ bedroom homes. Dollar volume. In aggregate, down a whopping 11.44%. The sales volume story repeated: condos up (+4.15%), homes down (-20.19%). Lower dollar volume for all home sizes. Average sales price. Again, down: 7.08%. 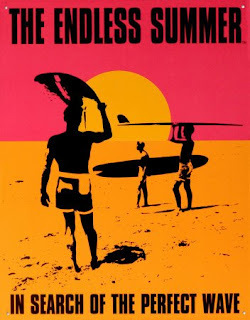 Average prices for condos relaxed [I need a thesaurus] .94% to $415,915, while homes dropped 7.22% YoY to $658,192. Days on market. 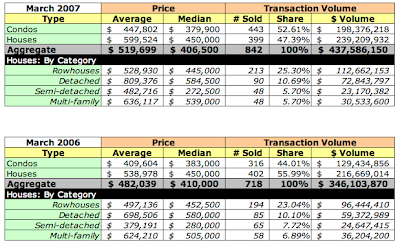 Yes, on average the DOM grew to 61 days, but a closer look shows that 2/3 of all homes sold within 60 days. Inventory. 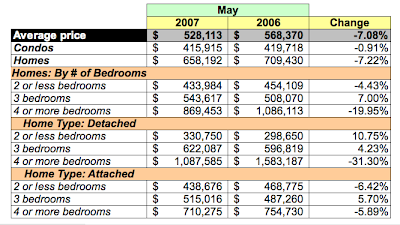 Based on May's transaction rates and active listings, there is a 4.35 month's supply of condos, an increase of 9.27% over April, while home inventory's fell 8.06% to 4.84 months. The most important conclusion I come to is that the Spring selling season is off to an inauspicious start. April's data was uninspiring and May's should make a seasoned real estate agent Google the nearest bar capable of mixing a stiff dry martini [three olives, please]. Condos are holding their own, but homes are getting squishy. The market was no friend of two and four bedroom homes; three bedroom homes had positive growth in average sales prices although the market favored the detached variety for unit sales and dollar volume. 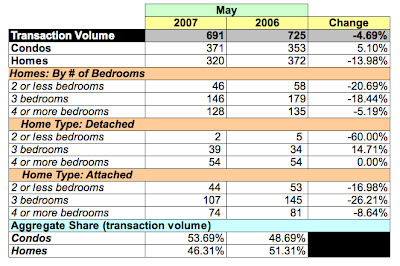 Of note is that for the first time in a while, high end homes (+4 bedrooms) had been tamed. 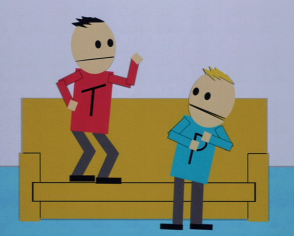 I'm off to Quebec City this evening for a few days so I won't be adding any new posts until I return. 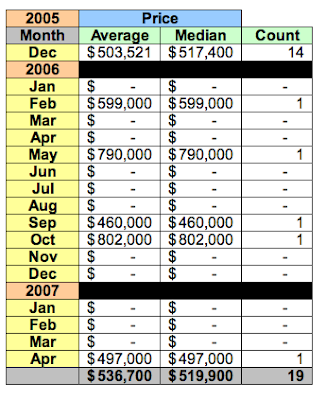 I expect by then MRIS's data for May existing home sales will be available. I also plan to post about a condo building that, to me, was the poster child of the real estate "investor" craze that just ended: the Dupont Renaissance. Sixteen units built, 14 closed the first month, 12 went on sale the next. 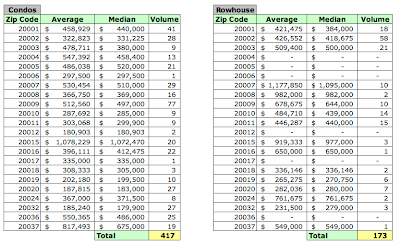 I've finished collecting and scrubbing [correcting] full value residential sales the District recorded in March 2007; the data have been uploaded to DCHomePrices.com and DCCondoPrices.com. 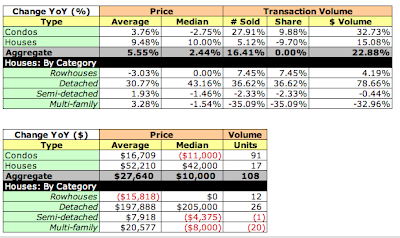 Caveat: Unlike MRIS, my data and analyses include new units [primarily condos] so there will be some differences in my conclusions about the market's state compared to a similar analysis based solely on MRIS reports, which only report sales of existing units sold and/or listed by real estate agents. 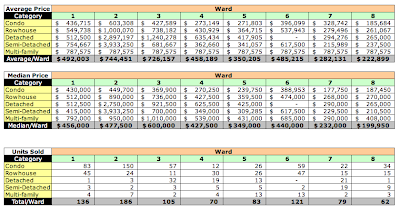 Also, this analysis is of sales recorded by the District in March as opposed to sales settled in the month, which is what MRIS reports, so there will be some discrepancies because of timing issues. 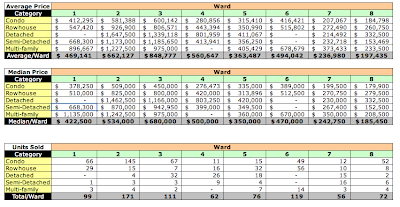 However, I believe the data do provide an indicator of trends in the District that could be useful. 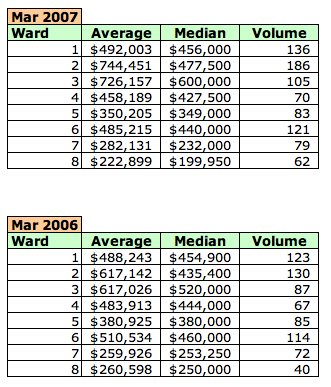 In March 2007, 842 residential sales were recorded by the District. The majority of sales, 52.61%, were condos. However, given their lower average prices as compared to houses, the condo dollar volume was 45.33% of the total dollar volume of $437.6MM. Compared to March 2006, aggregate average prices were robust, up 7.81%; median prices were negative; and unit and dollar volume jumped 17.27% and 26.43%, respectively. 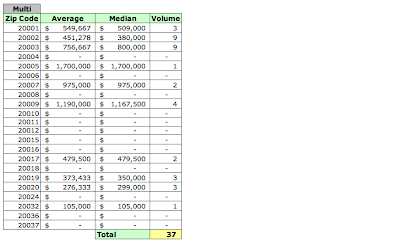 Those seven buildings alone represent almost 20% of all condo sales recorded in March. Excluding them from the analysis reduces the growth in average prices for condos by 1.73% to 7.6%, but tips the median price even further into negative territory, to a 4.96% drop in median price. 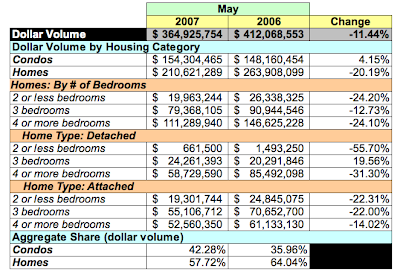 Single family homes fell almost 1% in unit volume while increasing 10.4% in dollar volume. 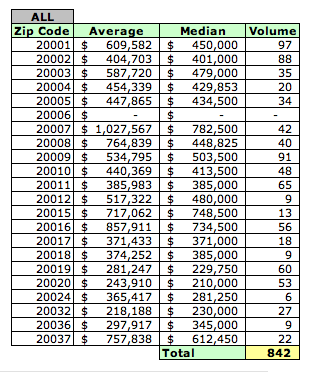 Average and median prices were a mixed bag for single family homes. 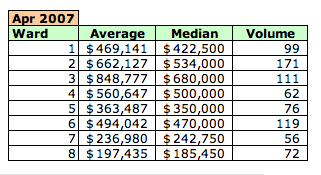 Average prices were up 11.23% while median prices were FLAT - 0% growth YoY. All categories of home had increases in average prices, while only multi-family homes had significant median price growth YoY. Semi-detached and multi-family homes had precipitous drops in sales volume; rowhouses and detached homes had 6-10% increases in sales volume. 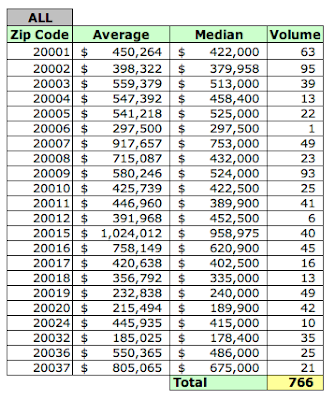 As I've previously noted: I classify multi-family homes as single family homes because I've found that homes that once were multi-family which have been converted to single family use have not been reclassified as such by the District. I may be painting too broad a brush here, but I can live with it. 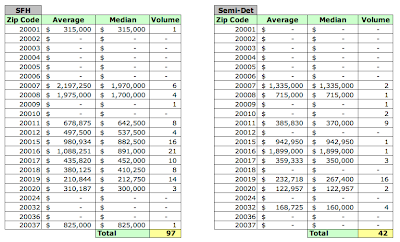 March 2007 average and median sales prices and unit volume by zip code. 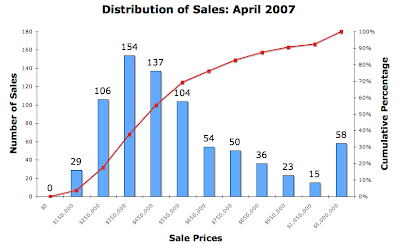 Data for home and condo sales recorded in the District during March 2007 have been uploaded to DCHomePrices.com and DCCondoPrices.com. Analysis is forthcoming.